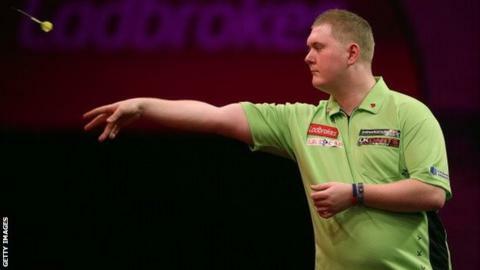 England's Ricky Evans came from two sets down to beat Australia's Simon Whitlock in round one of the PDC World Darts Championship at Alexandra Palace. Whitlock, seeded 10, missed two darts at a double to win 3-0 and Evans hit back to level before winning the deciding set with a 130 checkout. Earlier, England's number nine seed Ian White was beaten 3-1 by Belgian outsider Dimitri Van den Bergh. Phil Taylor lost only one leg as he beat qualifier Keita Ono 3-0. The 55-year-old, winner of 16 world titles, maintained his record of never losing in the first round of the event, producing a finish of 167 and then wrapping up the match with a 121. Taylor, who last won the world title in 2013, said: "Listen, I want to improve. I am sick of Michael van Gerwen. I am sick of getting beaten. This is my job. I could retire tomorrow - of course I could - but I want to improve."